Bringing a new pet into a home can be a bit of an adventure. 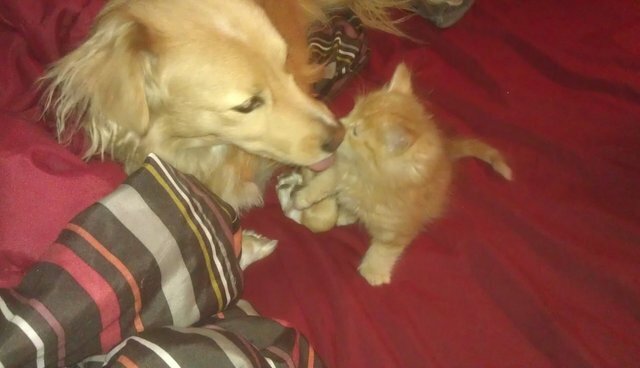 Redditor DontStartUnbelieving had no idea how his roommate's dog, Bodhi, would react when he brought home Maxx, his little rescue kitten. So he decided to document it. "This is my roommate's dog Bodhi." "And this is my boy Maxx. I got Maxx shortly after I moved in with my roommate." "We were worried at first that they wouldn't get along." "We didn't worry for long." Bodhi even introduced Maxx to all his favorite activities ... like "chinchilla stalking." Maxx has gotten a lot bigger since he first moved in, but a more recent picture of the two of them shows he and Bodhi are still totally BFFs. Maybe Bodhi could sense that tiny Maxx needed a big brother, or maybe he was just psyched to have a new playmate in the house, but somehow these two became the best of friends. DontStartUnbelieving posted on Reddit that if he and Maxx ever move out, "I would bring him by for visits."